When I ask this question the response is generally, “I watch my diet and have a good one”. When people say this it means they eat a typical American diet, choosing from the basic four food groups. 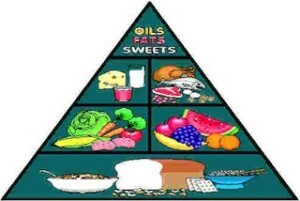 If they have a real good diet they are following the new food Pyramid. Why is there such a difference? The basic four food groups were merely obsolete. The human body must have evolved within the last few years, making its nutritional needs much different. Thinking we had been taught faulty information in school was unacceptable, so evolution and the changing nutritional needs of the typical American was the only feasible answer. I concluded that there was no problem. When the new food pyramid came out I was very puzzled. If the four food groups were so terribly wonderful why did they change them? Surely we were not following a plan that was wrong or perhaps flawed. Oh no! It could not be that the meat and dairy association had a hand in designing the “wonderful four”. Now, with newly evolved bodies and our changing nutritional needs, we should be grateful to those that have created this wonderful food pyramid, so we can continue to be the healthy society we already are. We have no heart disease; no diabetes no major illnesses affecting our society. Surely there are no special interests being served by this magnificent new dietary plan. After all, it has been on TV and it must be true. If we accept this new food pyramid without investigating the facts, we will continue to have illnesses caused by poor diet. (the official AMA policy “there is no correlation between diet and illnesses”). This food pyramid presented itself to the American public about the time the new food label appeared. It’s attempt was to help the consumers to determine what was in the packaging. Additives, preservatives, colors, dies and flavor enhancers were never addressed only fat, calories, sodium, protein, and carbohydrates; and only in mg per serving, not what type they are. Buried in the legislation that required manufacturers to label food products with this new consumer friendly label was the attempt to classify herbs and vitamins as either drugs or food, which would put them under the controls of the FDA. Fortunately their attempt failed. Just imagine getting a prescription from your doctor to take vitamin C. Land owned by suspicious drug dealers are routinely confiscated by the DEA. Your land grows peppermint; that would have been a controlled substance. If the DEA wanted to suspect you of selling your mint they could seize your land also. After all you are a dealer of a controlled drug. The facts are: the simpler your diet is, the better. If it came from the ground, a tree, or a bush it is better than a can, a bottle, or a box. Green beans are good food. I think we can agree on that, but fresh green beans are better than canned green beans, frozen green beans, freeze dried green beans, powdered green beans, or green bean flavor. So merely saying, eat grain is like saying the best way to get from place to place is with transportation. Yeah, right, how? Walking, skateboard, bicycle, motorcycle, compact car, or Cadillac. Saying eat grain is very general and vary misleading. The biggest degradation in our health today is not the processed food, although unprocessed is much more desirable, it’s the additives, preservatives, colors, or flavor enhancers; things that are not food. These are the true culprits of health; not white flour, or white sugar. It is the things that we cannot pronounce when we read the labels. Salt is OK, but the additives to the salt are very bad. Sea salt is much better than rock salt. Salt is a part of the body and used properly aids good health. Anything in excess is not good. Salting food after it is cooked is not wise. (salt cravings can indicate a Calcium absorption problem ) Using salt in the cooking process is much better and is better used by the body. A glass of water is wonderful when we are thirsty but a flood is ridiculous. Anything used in excess, even the best of things used this way, can be very destructive. Well the way I interpret the food pyramid is that the enemy is fat. So I can “have my cake and eat it to” especially if its fat free. If I would read the box and understand all the additives necessary to produce a fat free product that should not normally be fat free, I would probably choose a product with real ingredients and the fat. There are fat free foods but a manufacturer did not have to produce them they grow naturally. Fruits and grains are naturally fat free. Do we believe, in order to get a fat free food, we must rely upon some wonderful manufacturing process to allow us to eat what we would like. Which will allow us to have no guilt and take no responsibility.